ESPN is losing subscribers, but they are not losing money. 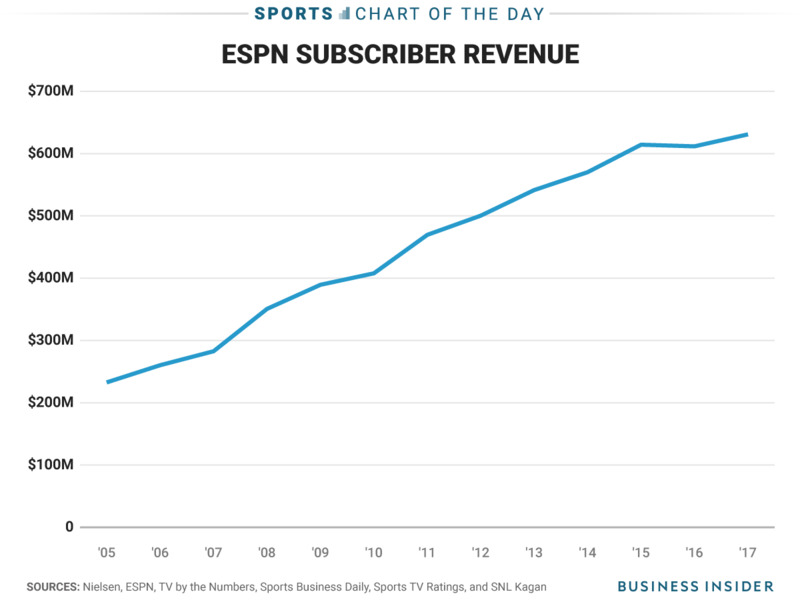 In fact, ESPN is making more money off subscribers than ever before, despite their dwindling numbers. 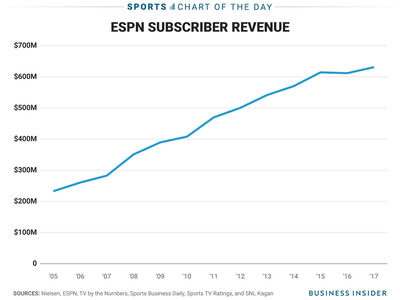 In 2011, ESPN peaked when they topped 100 million subscribers. However, in the six years since then, their numbers have fallen, losing nearly 13 million subscribers. It needs to be clear that there is a difference between subscribers and viewers. Nearly 90 million people subscribeto cable or satellite packages that contain ESPN. Despite the losses, demand for ESPN appears to be as strong as ever as ESPN’s subscriber fees continue to rise. That is the amount cable and satellite providers pay to ESPN per subscriber in order to provide ESPN to its customers. ESPN now charges $US7.21 per subscriber, by far the most expensive cable network. That is up 54% from what they were charging in 2011 and has shown no sign of slowing down. 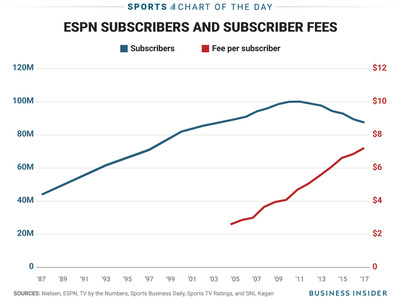 Because the subscriber fee is growing at a faster rate than the rate of losing of subscribers, ESPN’s subscriber revenue is actually still climbing. That growth has slowed, but that is a far cry from actually losing money. 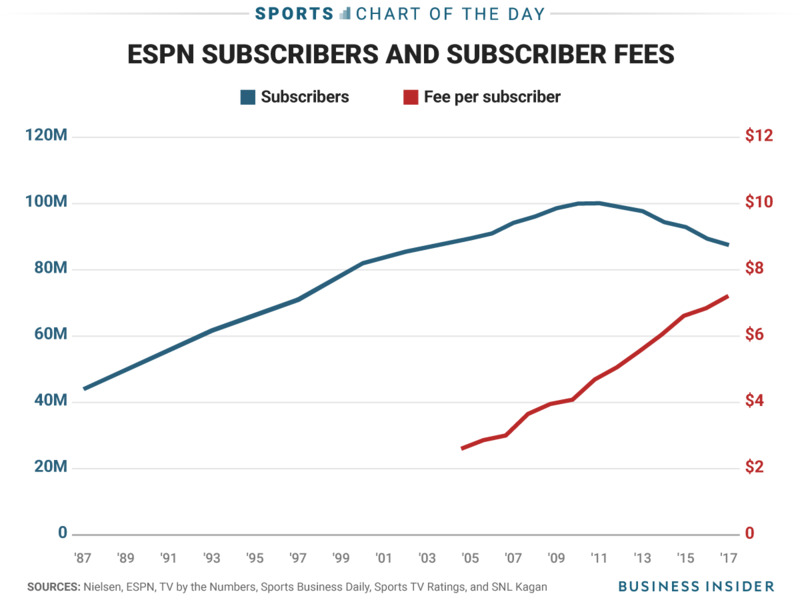 The downside for ESPN is that more than 60% of their revenue comes from subscriber fees and it appears that they did not anticipate the slow down in sub-fee revenue when they were dishing out billions for the rights to air various live sports. The good news for ESPN is that the loss in subscribers appears to be slowing down. ESPN’s subscriber base was down about 0.5 million in the last six months. At its peak, ESPN was losing nearly 3.0 million subscribers per year and was averaging about 2.0 million lost subscribers annually in recent years. More importantly, despite ESPN’s recent layoffs in an effort to refocus their priorities, ESPN appears to be doing just fine. That includes Disney’s anticipated acquisition of Fox Sports’ various regional sports networks, a move that is estimated to be worth $US22.4 billion and will give ESPN even more control of the most valuable commodity in cable television – live sports.